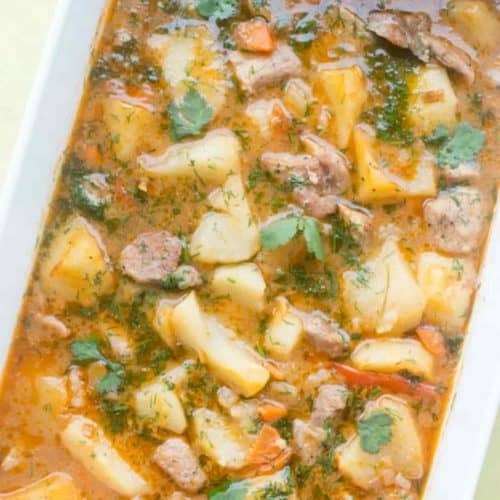 Braised potatoes are a popular dish in the Slavic community. When growing up, I remember us having this oh I’d say every other week for sure, if not every week. Every housewife has her twist on the popular dish and it becomes her version of the staple dish. Some enjoy pork as the meat, others chicken and some beef. We enjoy the dish with different meats. Bake in preheated oven to 400°F. 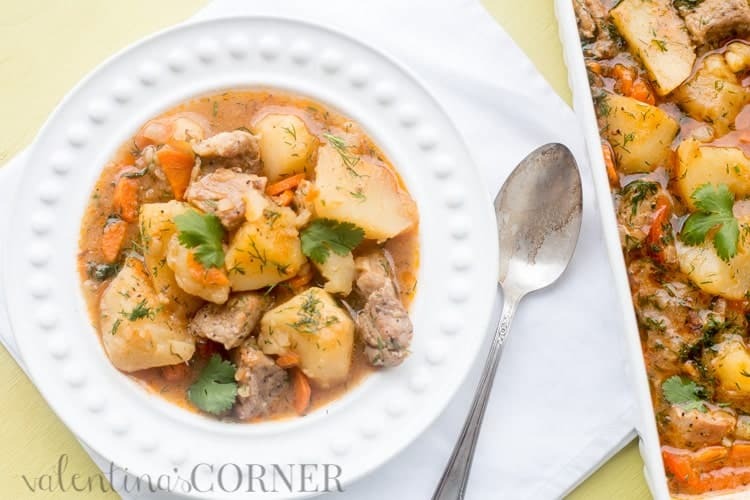 Peel potatoes and cut into large chunks (3 to 4 pieces per potato). Cover potatoes with cold water, set aside. Slice red pepper in thick strands, finely chop onion, slice carrot; set veggies aside. Heat 2 Tbsp oil, once oil is hot, add meat. Sauté meat 5-6 minutes (stirring frequently) until meat is golden. Transfer meat to casserole dish. Add the red pepper to casserole dish. In the same skillet, add onions; sauté 3-4 minutes (add the additional oil if needed). 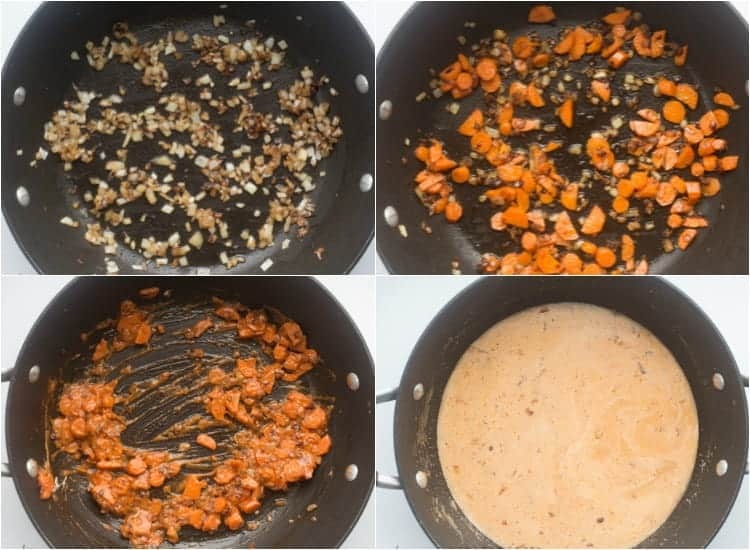 Add carrots to onions, sauté another 3-4 minutes. Add the minced garlic, stir well. Add ketchup and sour cream, stir. Add flour and stir. Add the water, salt and pepper and stir; let simmer a minute. Drain the potatoes and add to the casserole dish. Add bay leaf. 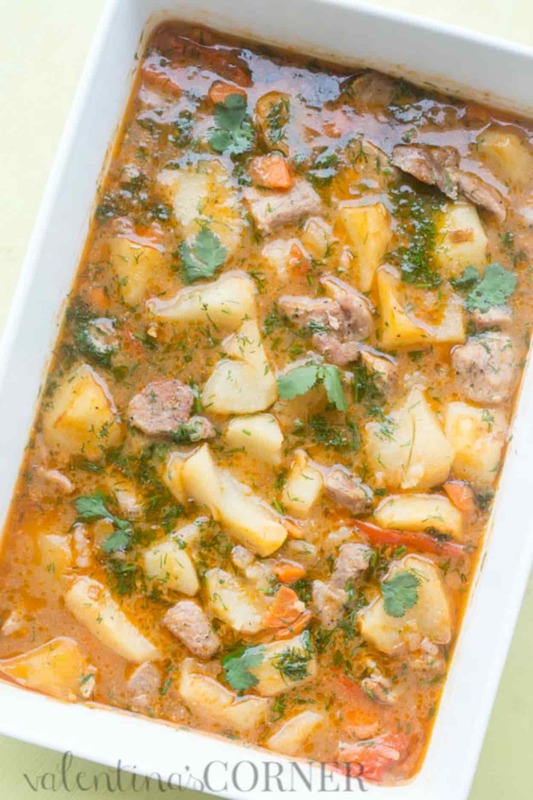 Pour the vegetable mix over everything in the casserole dish. Lightly stir. Cover with foil and bake 30 minutes. Remove dish from oven, and mix well. Bake another 8-10 minutes, until potatoes are cooked through. Add fresh herbs before serving, mix well. Enjoy while dish is still hot. Remove dish from oven, and mix well. Bake another 8-10 minutes, until potatoes are cooked through. Add fresh herbs before serving. Mix well. Enjoy while dish is still hot. You most definitely can, Natalie. You can also use the large pot you have and cook it in the stove! You might just need to cook it a little longer but that will work too. Also, thanks for the awesome review, love it! This is the first time I’m ever commenting on any food recipe I’ve ever made because I JUST HAVE TOO! This dish is sooo yummy. My hubby rushes home from work when I tell him I’m cooking this. The first time my parents tried my cooking was also this dish-and let me say-they LOVED it. Doesn’t ever disappoint, and I make it at least once a month. Thank you for brining back all the nostalgic feelings of childhood. Made this for dinner today! These are amazing! Tastes like wedding food! I love it! Thank You for the recepie!! I had to bake it for longer though, maybe it was because of the baking dish I used. Awww. That’s wonderful to hear. Thanks so much for sharing. ☺ Yes, baking time may vary. Baking dish, ovens and even the size the ingredients were cut make a difference. I am making this now, but it seems to be taking much longer than the 30min +10min time in the oven. I have it in a casserole dish, and has been in the oven close to an hr, potatoes still feel far from done… what could be the reason? Hi Lena, it could depend on your oven and the potatoes you use and the size you cut them. Just keep it longer, the wait will be worth it, I promise☺..
After I tried your recipe, I don’t make braised potatoes any other way! These are delicious! Dear Valentina, thanks for this amazing recipe!!! We all love it!!! Aww, Thanks for sharing, so glad to hear you guys approve.☺ We love it as well..
Made it with chicken, family loved it! Thank you for the recipe! Julia.. Thanks for the feedback. Chicken is our favorite as well:).. I’m so glad your family approved.. Happy family = Happy Mamma;).. This looks delicious! What kind of potatoes do you use? Russet? Yellow? I will be trying your recipe this week. Thank you Marinka!:). 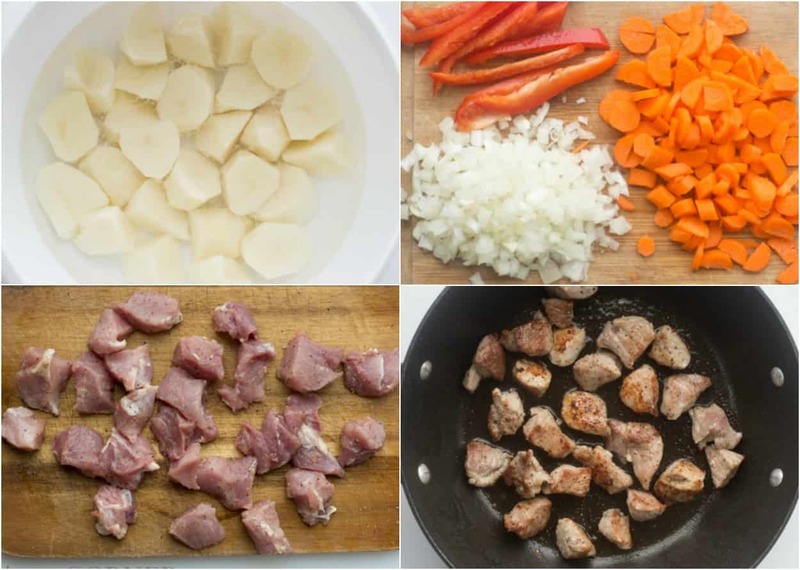 You can use any potato, really, I usually use Russet or Idaho, whichever is on sale :)… You can even use young potatoes with chicken as meat, that’s my FAVORITE!. The baking time might slightly vary depending on potato plus all ovens are different so just keep on eye on them☺☺.. Enjoy..
Sophie. So glad to hear that, especially your little munchkin! :) I like to use tenderloin or sirloin. Really depends on quality of meat, maybe next time after sauteeing meat, turn heat down and let it cook on low until it becomes more tender. ? Thank you for visiting☺☺.. 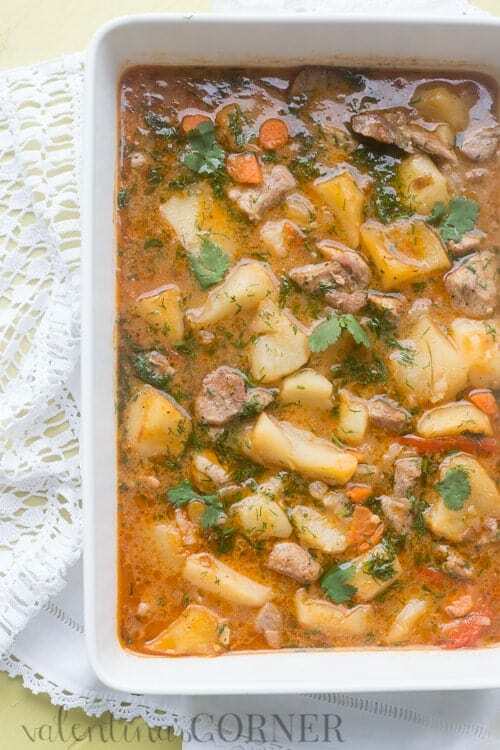 I made this recipe this week and it turned out so good! Thank you for sharing! Do you think I could bake this in my Dutch oven? Hi Oksana, you definitely can! The time might be a little longer.. Enjoy..?